I have reviewed a few of the Six Sisters’ Stuff cookbooks, and I have favorite recipes from each one. Their recipes are usually easy to prepare, turn out great, and I most likely have all the ingredients in my pantry. I’m super excited for this one because it includes some of my favorite restaurant dishes. You know, the ones where you’re saying, “I could make this!” And then you don’t because you’re really not sure how to? Well, they’ve got you covered! 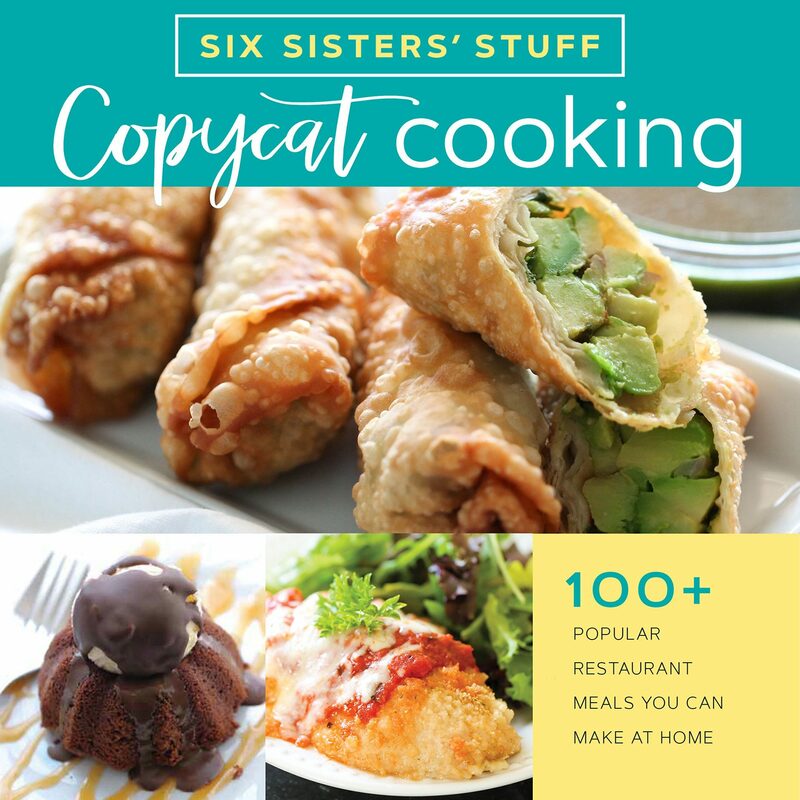 Without further ado, I introduce you to your new favorite cookbook: Copycat Cooking by Six Sisters’ Stuff. “The popular Six Sisters’ Stuff bloggers come to the rescue with a new collection of more than 100 easy-to-make recipes of popular restaurant dishes and take-out favorites for busy families. With more than fifty recipes that you can make in 30 minutes or less, this cookbook can help you make meal planning a breeze as you mix-and-match side dishes from one restaurant with main courses from another and finish it off with a dessert from a third. Save money while spending more time with your family. Change dining-out to dining-in for a memorable experience your whole family will enjoy. Ummmm……yummy! I’m so excited for this cookbook! It has recipes for some of my favorite restaurant dishes. And you know what? They’re actually doable! I could make these! They’re not too time consuming, they don’t have a million tricky steps, and they include ingredients that I can pronounce. I have most of the ingredients in my pantry already, or I know which isle they’re on in the the grocery store. It’s so refreshing to find good, easy recipes that my family will love and that I can actually prepare. Mmmmmm!!! I love me some Olive Garden Chicken Parmesan! I can’t wait to try this one! And look, only five ingredients. I can handle this one! This is my husband’s favorite dish at Olive Garden, so he’ll be very excited! Although I’ve never tried Disneyland’s Dole Whip Floats, I’ve heard they’re amazing. This one will be fun! I’ve never tried this Freckled Lemonade either, but I LOVE strawberry lemonade so I can’t wait to try it. Chili’s Molten Lava Cake is one of my favorite restaurant desserts. Seriously. It’s sooooo good!!! I love how the melty chocolate and the ice cream melt together. Mmmmmm! This is making me hungry and it’s 7:30 in the morning! Now I need a chocolate fix. I’ll need to make this dessert this weekend! And the list goes on and on and on… Need I say more? This would be a fantastic birthday or bridal shower gift, or just a fun addition to your cookbook collection. We’ll be having fun with this one for a long time! Recommendation: Everyone from the littlest chefs to the professional ones! 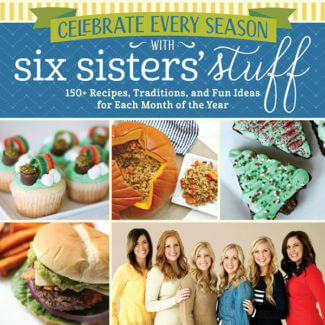 I have reviewed a couple of the Six Sisters’ Stuff cookbooks, and I have to say, I think this one may be my favorite! It’s such a fun idea for a cookbook! There are fun recipes for New Year’s, Valentine’s Day, St. Patrick’s Day, Easter, Fourth of July, Summertime, Back to School kid favorites, Halloween, Thanksgiving, and Christmas! One thing I love about Six Sisters’ Stuff recipes is that they are real. Right? They use ingredients that I know, and I usually have them in my pantry. There’s none of the “What is that?” recipe frustration. I can’t wait to try some of these out! I’m going to start on the Christmas recipes this week! Chocolate Reindeer Cookies, Christmas Tree Brownies, and Egg Nog French Toast, need I say more? I love that at the end of each category there is a page or two of fun traditions. For example, at the end of the Christmas recipes the tradition is “12 Days of Hot Cocoa.” What?? I LOVE hot cocoa. Seriously love it. I know I’m too late to do all 12 days, but I’m starting that this morning for sure! Raspberry Hot Chocolate, Caramel Hot Chocolate, S’mores Hot Chocolate, Candy Cane Hot Chocolate…I think I’m in Heaven! And then after next week I can plan my family’s New Year’s Eve party. On New Year’s we usually have what we deem our “Processed Food Extravaganza.” We go to Costco and buy all the processed stuff we don’t buy the rest of the year: corndogs, egg rolls, chicken nuggets, pigs in a blanket, french fries, you name it! Then yes, we totally pig-out! This year, however, we may need to break tradition and try these yummy Shrimp Taco Bites, Sweet Polynesian Meatballs, Cowboy Caviar, and the Snowmen on a Stick. Or better yet, does anyone want to make them and invite me over? I am excited to delve into this cookbook! Click the link below for a cute, short video about this fun cookbook!